I BOUGHT THIS FOR MY DAUGHTER. SHE HAD BOUGHT ONE FROM A SCHOOL FUND RAISER THE YEAR BEFORE AND WAS HAVING A DIFFICULT TIME FINDING A NEW ONE. SHE ABSOLUTELY LOVES IT. SHE SAYS IT KEEPS HER BILLS ORGANIZED AND SHE CAN PAY THEM ON A TIMELY MANNER. PLUS IT HAS A SECTION TO KEEP TRACK OF WHEN YOU PAID YOUR BILL, TO WHOM, AND HOW MUCH. SO NOT ONLY IS IT GREAT FOR KEEPING ORGANIZED IT IS ALSO GREAT FOR RECORD KEEPING. I have had three of these so far and I love that your bills are all in one place and space for each month. I would like to see them go back to the size they used to be but this still works. completely upgraded my record keeping from more time consuming and taking extra space for storage to easy monthly record keeping and easy storage. i have used these for about 8 years. I know where all my bills are and when they are due. I keep the bill stub in the envelope for each month when I pay it. I also keep the whole book for tax records each year. This is the best bill payment tracking book I've found. I really like it. I have used this now for three years and will continue to buy it as long as Walter Drake sells it. I can keep on budget and get bills payed on time and keep track of where every cent goes to in my household and all in one place. It is lightweight and takes up little space in the drawer. How can any one complain when you know if you have not paid a bill for the month. Life is confusing the way it is. This is a life saver. If you run a large business, not for you. At home use fantastic!!! Don't ever stop making them. They are a piece of mind to know exactly where your at with every month & never miss a bill.Gives me the bottom dollar where & what I spent every penny. Surprised what I have left in the bank! Thank you! Keep making them, please!!! I buy this every year to keep record of all my spending. Lots of space, pocket in each month holds bills & receipts. Strongly reccommend purchasing this budget book. Great price,too. I would be lost without this organizer! With a memory (or lack thereof!) like mine, I would not remember to pay my bills and pay them on time if I didn't have this handy little organizer to 'remind' me. I'm ordering a new one because I've used the last one for 3 years and it's time to replace it. Thanks, Walter Drake! to enter bill yet. I'm sure it will be a big help. I write down all the bills i have to pay each month. when i pay them i put a check mark next to it. keeps me from guessing where my bills are and when they are due. i write down all the due dates then when i pay them i put the paid bills in my file cabnet. wonderful product. wish there were more designs tho. but it does work for me and i would buy them over and over again. all you do is add the yr for the orginazer.. wala. thanks you very much.........there is nothing that i don't like about it except more choices for the cover. thanks very much. I have used this monthly organizer for years. Very helpful! I have to keep track of three households. I have been looking for this exact record keeper. I was so glad to find this and plan to order more. The booklet is exactly what I need to keep track of where the money goes. The pocket for receipts are an added benefit. I bought two of these organizers and gave one to my son and we both think they are great. They have plenty of space to write notes and what bills are due and the envelope is a good place to keep the bills handy. I keep my stamps and return address labels in the envelope too. Everything is right where I can find them. No more searching for anything. I have used this organizer for my personal income and bills the last two years. this year, I'm planning on at least one as a gift to another senior. It simplifies your personal acctg in many ways. As each bill comes in, I put it in the pocket for the month it is due. When that month arrives, I can take out all the bills, write my checks and record the pymt data on the receipt part of the bill, and then refile in that month's pocket again. It keeps everything handy and centralized. I also use it to record my various incomes during the month. I also use it to file my ins papers, unusual expenses, mo'ly bank acct stmts, and just about everything else that has to do with my finances. I don't have to go through file after file at the end of the year, it is all handily stored in the booklet. Every month, when I pay my bills, I make a log of what bills are to be paid. After I pay them, and record the check number and amount on the receipts, I pit them in a Zip lock bag with the month on the bag. With this organizer, I can put the amounts and receipts in the pockets for that month. In case I need to go back and look up something I paid already. Thanks for making my boring job of writing bills easier. Everything I have purchased from Walter Drake Company has been useful. Thanks for carrying great products. 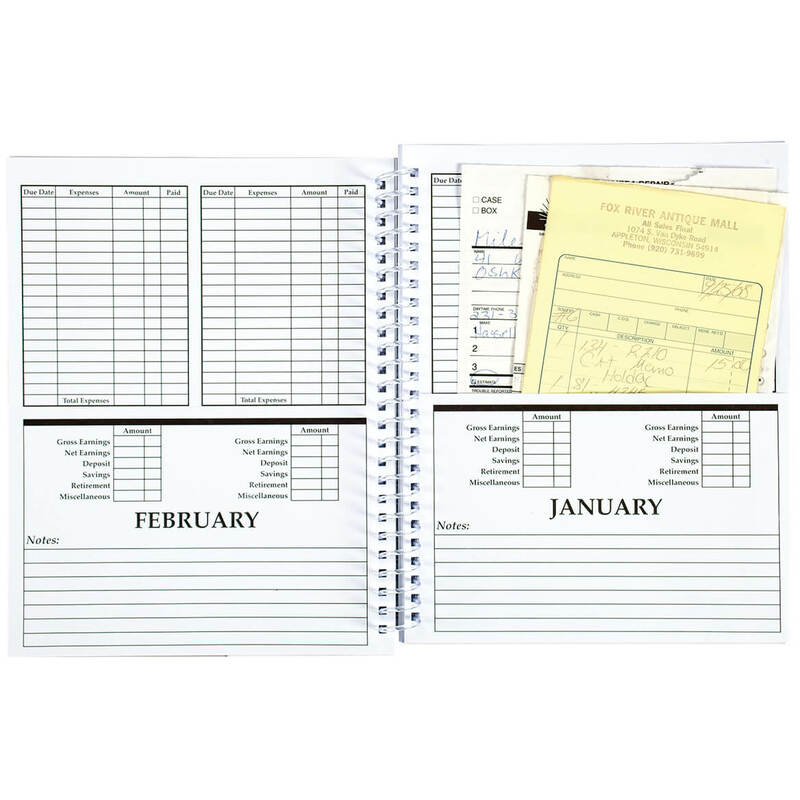 Lorrie G.
I used this bill organizer for the first time last year, 2016 and really liked it. I like to keep everything neat and organized and this really worked well for me. So, this year, I bought two, one for 2017 and one for 2018. Planning ahead. if I need to check if and when something was paid. Had this product once before. Loved it so much that I bought one for myself and my grandson. Perfect catch all for any bills you have. I had one and it's great! I used it for years so I bought one for my elderly Mother to get her organized. She loves it too! I get paid once a month and with everything written down it's a breeze to pay bills. You can keep your statements in the monthly slot. When you get paid just grab your book and calculater and have all your bills paid in one sitting. The address books are for home and worm. Haven't started to use them yet but think they will be great. I purchase this monthly bill organizer every year because it is so helpful for keeping records, especially for income tax time. The new spiral binder is smaller & easier to store, a plus over the older ones. I have ordered this product over and over again. It is the perfect size and has ample room for bills and receipts for each month. I have ordered this budget book for many years. It is most helpful in keeping track of all my expenses, especially those needed at tax time. Since I have started using the Monthly Bill Organizer I have been able to manage my money better.I bought one for a friend & she is so pleased with the organizer that she will be ordering from your company! Thank-you so much! Never lose track of that bill again, this book has pockets for storing them monthly, There is plenty of extra writing space, also space to figure out amounts. It's light weight and easy to read writing. I definately will be ordering a few more of these for friends as gifts. I love these organizers.I store 2 years of paid bills in each one. Makes it very easy to find what your looking for. I buy this item every year. I use this product for my monthly bill receipts. It helps me stay organized. It is so convenient and easy to keep track of my receipts month by month because it has pocket pages. You can also record due dates, payments, etc. I buy this product every year. It's a great item! A tax time all my information is recorded & ready to be filled in. This bill organizer is a perfect size! It has pockets for each month, and a ledger on each page. Excellent product! I refer to this organizer most every day. Easy to store in my desk drawer. I have been giving as wedding gifts. Now thinking of starting earlier, like high school grad gift! I FINALLY HAVE A FORUM FOR WRITING A REVIEW ON A MOST LOVED ITEM. I HAVE USED THIS FOR MANY MANY YEARS. MONTHS ARE ALREADY PRINTED ON THE PAGES. I USE ONE SIDE FOR THE BILLS AND THE OTHER COLUMN FOR OTHER MONIES WE SPEND, SUCH AS ANNUAL, SEMI-ANNUAL; GIFTS AND CONTRIBUTIONS. THIS BOOK MAKES YOUR BUDGET AND BILLS SO EASY TO DO ALONG WITH KEEPING THE INFO READY FOR TAX TIME. THERE IS REALLY NOT MUCH EFFORT WE PUT IN SINCE THERE ARE ALSO POCKETS FOR EACH MONTH TO PUT THINGS IN YOU MAY NEED. I CAN'T SAY ENOUGH ABOUT THIS EASY-TO-KEEP BOOK! I hope to buy this product repeatedly. I am hoping this product stays available for purchase. I depend on it in organizing my bill paying and other important financial information. I purchase one for every year, and have been doing so for the past 8-9 years, if not more. 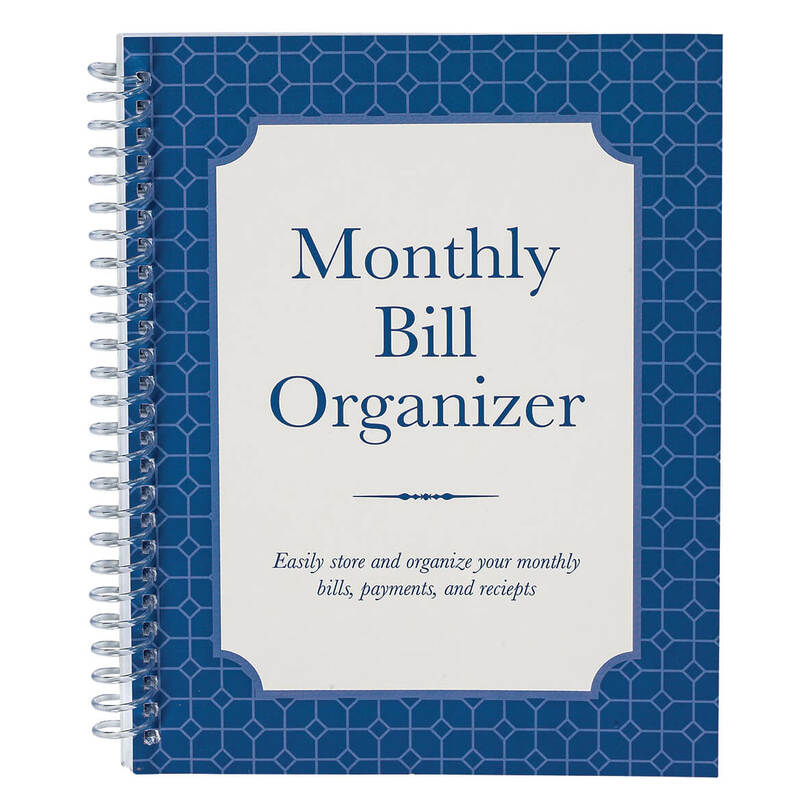 I prefer this monthly bill organizer as it is affordable, and practical for my daily bookkeeping. I will be purchasing this product once again in the future. EAsy to store and Keep track of Your Monthly Bills!Place your bills as they come due and they are easy to pay and keep track.I buy a New one Every year for past 15 Yrs and I find it very efficient for Bill Keeping! !I just store away the year before and They are easy to find and all together is you need to look for the Previous Year.Nice Gift for Elderly!!! Keeps everything Orderly. THIS HELPS ME TO STAY ORGANIZED AND NOT FORGET TO PAY A BILL. ALL ARE LISTED NEATLY AND I CAN SEE WHAT IS PAID AND WHAT NEEDS TO BE PAID, AND HOW MUCH I OWE. I have had other was of keeping track,such as filing cabinet but it is stationary and never where you need it. I have used a shoe box and that didn't work. I used a notebook and the papers tore out. I think I am going to use this Monthly Bill Organizer very efficiently and will be wanting another one for next year 2015 as i wont be starting this one till January 2014. I also bought one for my daughter when I bought mine. It suits me perfectly as I am not at all comfortable with computer programs which are meant to do the same. Easy to use. Quick easy access to budget info and paid receipts. I use this for my bills Listing them each month to keep track. It is just the right size and not so big. It is perfect for me. I have used this organizer for myself Now I decided to give the rest of the family something great. I buy a new one every year, it helps keep my bank acct. straight. I was always messing up my bank acct. until I got this book, works wonderfully for me. The pockets are wonderful for holding receipts and you can look back on them because they aren't lost this way. If you have recurring payments you can pencil them in so they're not forgotten. I'd have trouble getting used to another way. This is my favorite monthly bill organizer!! I bought 2!! They keep my bills organized monthly for the year. I can check off the paid bills as I go along throughout the month! I highly recommend this product! It is quite reliable. It helps me budget my small income every month. This organizer has the months spelled out for you with pockets and room to write everything down. Never loose track of anything again. You can save bills, stubs, credit card receipts and always know where they are. This organizer is like a small book and will fit in a drawer. Love it!! I use it for my different exspense tracking for each year for my horses, farm equiptment, home exspenses and they're cheap enough you can have one for each catagory, and reuse it the next year if you just use the pocket for the reciets only, I get new cuz of the inventory of each wrote on the side lines per month. will continuse to use them. Great item to store all your bills in one place.never lose them. I have been using it for a couple of years, I write in pencil and just erase when I need to post that months bills. I have used these for years and they are great. I would panic if they were ever discontinued. I enter all my expenses and the date they were paid so I have the accurate records I need. On the right side of the page I place all tax deductible items and keep the receipts for these in the pocket. I wish more stores carried what Walter Drake does! I've been using the Monthly Bill Organizer five years now. I simply wouldn't be able to stay organized without it. I sure hope you always carry this product as I will continue to buy every year. I have recommended this to many of my friends and will continue to do so. Thank you Walter Drake. Always have the product I am looking for. I've used my bill book for many years and there the best knowing how to budget my paycheck. Know exactly how your money was spent for a particular month in a particular year with this great monthly bill organizer. I use one for each year. They are great! I also give them to friends. I have used this organizer for you bills for several years. It is so helpful was excited to see you still have them. I have used for years. Love it. Great for keeping your bills organized. I lost the first one, and they were happy to send me another one (granted I had to pay for it, but since I'm the one that lost it, I didn't mind). I am now on my 7th year of using the Monthly Organizer! I use to just file my bills in a file cabinet with folders for each companies bills---very cumbersome, and not so easy to go back and reference. With the Organizer, I just go back to the year, and the month and everything is right there and it also allows for note taking and other documentation surrounding each paymnet,ie: they over charged me and I had to call them to straighten it out. Then, what I do with the Monthly Organizer is place them inside of my fire proof file cabinet! I have used these books for at least 7 years. It makes keeping a budget easy. I also keep all my paid receipts in it so when tax season comes I know what I paid and have a receipt for the whole year. I order one of these organizers each year . I use this for all my monthly bills and find it always comes in very handy when I want to look up something that I have paid or have purchased with dates and details included in the writing spaces. Just right amount of detail. Perfect for my monthly bills, I will buy one every year. I've used these for years! This is great for keeping all my bills in one place and a record of all my payments. I like it so much I bought one for my daughter for a gift. I think every person who is budget minded or just wants to see where their money goes, this is a great way to do it. Just what I needed, great layout and the pockets make it so easy to have the bills handy to mail. This is great my mom wanted one so i bought her one! To stay organization. Keep things at hand. This is the 3 year that we've bought this bill organizer from Miles Kimball. We love it and it holds up greatly!! We recommend it highly!! I buy Thei Every Year! Every thing is always is where I can find it .All my monthly bills are organized in the one little book.I put My new incoming bills right in the right month then I can sit down and pay each bill for that month. Then I put all the Paid bills right back in the pocket for that month. So Easy to keep my records and payments. I bought these for my grown children. It is a great way to keep them organized with their busy schedules. They absolutely loved them. Great find. I will deffinately buy more, great! No one else is selling this product and it is the best way to keep your bills in order. I have used similar ones for several years and they have all stopped making them. Great buy. I will buy as long as you sell them. I have used the product in the past and I like it. My Organizer is for my personal use and can look back from year to year on my expenses. Just a great Organizer to have. A book-like configuration is so much better. Suggestion: option of choice between this or a larger size. This bill organizer is just the thing I was looking for to keep my bills together in one place and organized. I've used the Monthly Bill Organizer for 5+ years and will likely continue to do so. I would certainly recommend it to my friends and family. It's good for my personal receipts for taxes. I would not recommend it for business as these tend to be more than personal receipts. I love this organizer! It's a bit flimsy but I am ok with it because it keeps the price down. I will buy one next year. One customer complained that the pocket for the bills covered that month's chart so one couldn't see what was still oustanding and due dates. I discovered that I could insert my bills into the pocket on the next page, then when the month is over I move them back or file them. I would like the organizer to be a bit larger and alot two pages per month. A monthly chart for keeping track of tax info such as deductions, etc would be useful too. Sufficient to keep track of monthly receipts. Can be useful for tax purposes or to simply track your spending for budgeting purposes. This organizer has pockets for the receipts, bills, (whatever) and has 38 spaces on each months page for date, expense, & amount. Although the paper is not extremely heavy it should easily last for one years records and could possibly be reused for another year if you do not write on the pages (just use it to store your receipts, etc. However, I find the price is low enough to purchase one for each year. I would buy this item again. Great gift. A budgeting must have. Roomy and great visual to help in dreams if paying debt off. You can make a good plan and follow it as you see debts being Paid off. pockets are just what I need for carry my statements. Repeated purchases of this item. This is a handy, convenient organizer for me. I have purchased this product numerous times in the past several years, and I will continue to do so as long as this item is available and fair in price. First time to make use of this product and hope it fits my needs. Will give a better revue later in the year. So far it is working. It keeps all my bills in one place I don't need to keep all the the bills after I pay them I have all the infomation on hand. I've been using the Monthly Bill Organizer ever since I discovered it at Walter Drake, which must be at least seven years now since I started using it. It's perfect for keeping all your monthly bills in one place organized for an entire year. You can also write summaries of payments for each month. It's contructed in a binder that is relatively durable and can be stored like a book. Once you start using it you won't want to be without it. Very handy organizer. Keeps bills in one place. I got mine almost a year ago and I bought one for my daughter-in-law for a stocking stuffer this Christmas. I have used this organizer for 5 years and just ordered 2 more. I like it because of the simple design and place to put my bills. It is only good if you do not have a large number of monthly bills, it is of minimal size. I like it for that reason, I can easily find my bills, list them neatly and check off when they are paid. I use this to keep track of my bills. It does the job and has a lot of writing space but is a little too small. Some of my envelopes stick out of the top. A small managable easy to use product with just enough room to keep things in order without being too bulky and inconvenient. I use this every year for at least the past three years ... great little convenience to organize bills, write due date and date paid, space on bottom page to write notes, etc. Also has a pocket to store paid bills, notes, etc. My only complaint is the last one I ordered came with the spiral binding not properly inserted all the way down (I should have taken it apart and reinserted it myself before using it). I wish it had a more stable/sturdy construction - but for the price - this book is a great value. It helps keep bills organized so you don't forget to pay something on time. Mostly used for storing receipts. Helpful at tax time. Great for organization of bill payments. The lines are small, but if you get passed that, it's a great buy. I THINK THAT IT IS A GREAT CONCEPT. WITH MY BUSY LIFESTYLE (SINGLE MOM AND 2 YOUNG KIDS AND FULL TIME JOB) IT HELP ME ORGANIZE THE AMOUNT OF BILLS AND WHEN THEY ARE DUE WITHOUT HAVE AN UNORGANIZED STACK. JUST WISH IT WERE A LITTLE BETTER QUALITY. I am retired finance director-looking for a compact, one year bill paying organizer. I had been able to get a very good one thru my credit union but they have been discontinued. I went online and did not find any suitable. Then I found your website and the one I purchased is close, it is just not enough room to list all items. If you should know of any better, please let me know. The product was ideal for what my needs were and cost wise I couldn't find better. I wouldn't do without it. This is a very practical item. I have purchased one every year for about the past 10 years. Easy to use and keep a record of annual expenses. Will rip if too many bills are stored inside. Serves my purposes quite nicely. helps me keep my monthly bills in one place. Quickly know if I have received a bill and if I have paid it and the check number and due date. The Monthly Bill Organizer is an inexpensive way to track and organize my family's financial obligations. There are plenty of lines to record expenses, and a handy pocket on each page for saving monthly statements and receipts. For years I've used this organizer to keep track of what bills are due when as well as which have been paid. I tried other systems, and this is the first one that really worked: no more late fees because I misplaced a bill or just forgot. Also, I can easily compare changes in expenditures from year to year. My only complaint is that the pockets for filing receipts are too small, so that before the end of the year the pages are falling out and the spiral binding doesn't allow for repairs. I wish the blue plastic spiral was not so big. IT isto write on the on the side of the book. I have kept an invoice/bills organizer for years. The are great to keep bills from being late and to take a quick look at what has been paid and what hasn't. This one was smaller than the ones I've purchaced in the past but it will work. Like I said I can't live without the monthly organizer to keep track of my bills but you guys really raised the price up high on it [...]. It's a little disappointing. The design is nice and I can store invoices received and paid. I like the bill organizer, but it is not made sturdy enough for me. I plan to continue using it and handle it so that it will last as long as possible. The product is useful however, I found that the spiral rings that hold the book together is to large for the book. The other thing is that the lines are not wide enough for writing. Write in pencil so you can erase and used a year later. Like to keep a paper tally of all bills I pay. I purchse the bill organizer every year. I do wish it was made a little heavier and larger, otherwise it works for me. It was much smaller than I expected, so it is hard to fit all my bills in it, but it is nicely put together, good quality, and works for what I need. I wish the design was better and stronger. You have to remove old bills to see the list to add data about new bills. However I haven't seen a better one offered anywhere. It is nice, but very small. Very disappointed in my organizer. I was disappointed in the organizer because it arrived with front cover upside down. I would have been embarrassed if I had sent this to someone as a gift. I serves it's purpose for the cheap price I paid. Took too long for delivery. I was a little disappointed when I recieved my order.The product was paper constructed and very flimsy. I have a bill organizer that I ordered from Current Inc. a few years ago and it has a hard front and back cover and much bigger in size. Wanted this to help track personal finances and budget but it is not usable for me. Not enough space to list Businesses, and expenses, dates etc. pages are small and flimsy . Price seem reasonable but quality and design of product is very poor. Shipping was more than cost of item. To return is additional shipping. Disappointed in my purchase. Not enough room to write breaks easily thought it would be a hardcover. Not heavy duty enough, tears easily, should be folder size...would be better in the log in sheet was on the pocket instead of behind the pocket..however...it does keep everything organized..
Good price but too flimsy! We try to stay organized with our bills during the year and like to keep everything in one place and labeled monthly. In the past we have gotten monthly organizers from different companies that were larger and more sturdy but paid more money. This was a good price but would have paid more for better quality! I was looking for a bill organizer and i thought i came across a deal but you pay for what you get. Its really small and my bills bearly fit in each pocket. Im also afraid of ripping the pages when i put my bills in the pockets. Definitely not what I expected. Bought a similar product from a different company that was much better quality for a lower price. Would not purchase this again. I usually buy my annual bill organizer from checks in the mail. I loved your price ,so I ordered from you online. When I recieved it in the mail I was not satisfied with the size or durability. Not enough spaces from line to lines. Should be larger. It looks a lot bigger in the picture than in person. The organizer is very flimsy and will not hold much. Worst thing: too small, pockets do not hold normal size paper, etc. I should have spent my money on a binder with pockets. This bill organizer is very poorly made and a lot smaller than I though it would be. I will not be able to use this for my home bill paying needs because it is too small. It is only good for daily appointments. Wouldn't have another one ! It is very small and not at all what I expected. I will not be ordering another one. I must say it does what it says, it keeps you very well organized. But the quality of the product was very displeasing. Didn't like it at all. The pics make it look so much bigger. Didn't like it at all. It's smaller than the picture. I was very disappointed. I would give it 1 star. I had an organizer similar to this; much heavier construction. You can make one better than this! The only reason I did not send it back is because the money I would spend to return it would outweigh the [$] I would receive back! RUN! DO NOT BUY THIS PRODUCT!!! This product was not at all what I expected to receive. Very cheap! Paid as much in shipping as I did the product and it was so not worth it! Disappointed...not what I had expected. To make it easier for me to keep everything in one place. It works to keep track of bills and payments. Ive been reordering every year for about 10 yrs. They were in my price range. IT HELPS ME TO KEEP MY MONTHLY PAYMENT FROM GETTING LOST, OR BEING MISPLACED. its a good way to keep up with bills and payments. Just need to organize bills for 2019. To keep all bills in one place. It helps me keep track of my bills. I have used this Bill organizer for several years & find it very helpful. Still like to look at the “written word”. Easy to pick up and view! I've had these before and enjoy having everything organized. I've used this organizer for 5+ years. Didn't order one this year (oversight! ), and I've been in a frenzy! This keeps me up-to-date and organized with our payments. Love it! It will organize all payments made during a given month. Instead of keeping the entire bill with the payment confirmation number I can just save the payment slip. This will definitely help me to be better organized. Like to be able to organize budget. Thank you. I buy this every year to keep me on track with whats due and the date and I like the size all others are to big. I have been using the Monthly Bill Organizer for the past three years. I find that this is a very good way of keeping everything organized with my bills and I just can't find a better way than to use these handy little books with the pockets for each month to keep bills and purchases handy. This is a good purchase. Highly recommended. This is the best bill organizer I have found and at a great price. It seems to be well worth the money and sturdy. I buy a few at a time for the years. This is the perfect organizer. I love it. Have used this planner for quite some time. Needed to replace it for next year. Good way to keep track of your bills and spending. i have been using it for several years . Helpful and I need it..
Is there a monthly calendar in the organization? BEST ANSWER: No there is not. It just has all 12 months with a pocket for your bills and a place to write date, expenses various notes. Love my Bill organizer. Makes it so easy to keep track of all my bills. Yes i faithful use the monthly bill organizer. i list my bill accorderly to the bill due date and pay them before it due date. Also i order the large print calendar. i love both products. Unfortunately there is not, but I have been using these for many years and LOVE them! The pages are easy to write on, no smudges, and I would be lost without these in my home office. Thank you for your question. No calendar is included, it is just an organizer. We hope this information will be of help to you. BEST ANSWER: The monthly bill organizer really helps me balance my statements. This organizer is the only thing I give to my CPA each year the prepare my taxes. I have been getting better results since I have been the organizer. You can definitely use this to help you balance your statement. I just use it for making sure I pay all my bills on time . Also To remind me when I have annual bills like car license due. I love my monthly organizer. it helps keep all of my bill in order. Best I have found. How many spaces for creditors? BEST ANSWER: Thank you for your question. There are 19 total lines, none of which show creditors, but you can write any amount you would like on the lines. We hope this information will be of help to you. So if I buy it in May, I start in May. It is not year dated, so I can use it thru the following April, correct? I cannot read what the boxes in the center of the page say, even with magnification...what? lol! BEST ANSWER: Thank you for your question. No year is listed this can be used any year. We hope this information will be of help to you. what stores can i find these at? BEST ANSWER: Thank you for your question. We are a website and catalog company only we do not have a store. We hope this information will be of help to you. I want one for 2017 is that what will be sent to me if I order? BEST ANSWER: Thank you for your question. There is not a year printed on the bill organizer. We hope this information will be of help to you.